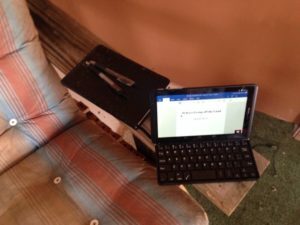 Writing online off the grid? 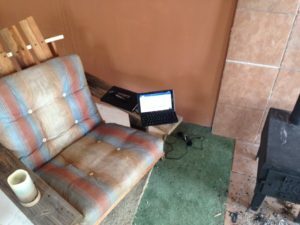 Some of you may wonder how I write and post pictures “off the grid”. I cheat. I am off the wired grid but I still have cell service and a generator. Cell service is sporadic and I usually need to go outside to connect. But for writing I have these. That is an 8 inch Ellipses tablet and a tiny Bluetooth keyboard. And behind that is a paper notebook and a couple of pens. I can also watch downloaded episodes of Grizzly Adams on the tablet.